Home Writing News Foy now available at Amazon and other online stores. Foy now available at Amazon and other online stores. New Novel by Gordon Atkinson Foy: On the Road to Lost, to be released March 1 from Material Media. 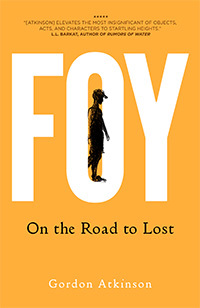 Written as a series of connected stories, Foy: A Novel by Gordon Atkinson is where we meet Baptist minister Foy Davis. From boyhood adventures in Fort Davis and Houston, Texas, to his unorthodox ministry in San Antonio, to his subsequent bolt from church life to New Orleans, we follow the thread of one man’s struggle with the place of religion in his life. With clarity and spare dialogue, Gordon Atkinson portrays a good, caring man who is escaping his history to step into a more authentic life, even if it is a strange and frightening thing. As Foy attempts to salvage what he can of the religion he once knew, the reader is invited to walk along with him on this journey.